The biggest struggle in teaching is that there's never enough time for all you need to teach your students. 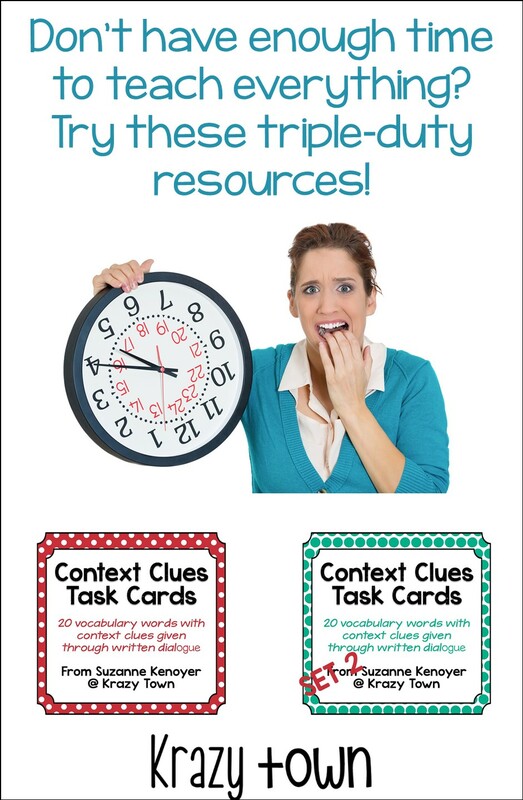 With all the demands on your time with students, it's so important to, whenever possible, use resources that do double or triple duty. When they finished CUPS, they started on a vocabulary activity. I've taken that activity and translated it into a resource you can use easily. 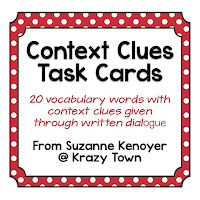 It incorporates vocabulary, context clues, and dialogue. I've included all three types of dialogue - tag at the front, tag at the end, and interrupted dialogue. 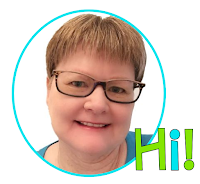 Punctuating dialogue is a difficult skill to master. Seeing it presented several times can help reinforce the rules. You can also see that I've provided several context clues. Those on the card above happen to be synonyms for the vocabulary word. 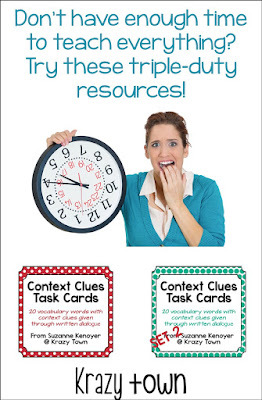 Other cards include more types of context clues so students have practice in multiple types. An answer document for students to record their answers and an answer key are included. Keep in mind, though, that student definitions may vary from the "official" definition. As long as they get the basic meaning, I'd count it as correct. 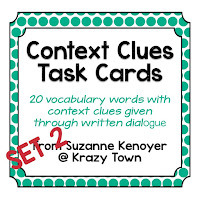 You can use these cards as an independent review activity or or with a group of students for a concentrated reteach on context clues. Each set comes with both color and grey-scale backgrounds. Click on the product cover below to see them in my Teachers Pay Teachers store.